We have seen a difficult trend for independent interactive content creators: Fifteen years ago content creators were paid for creating content. Ten years ago creators were downgraded to receiving advertising money. Five years ago creators had to pay to have their content shown. Today, content creators have to pay consumers to partake in their content. This, of course, is a generalization, but in the digital world the contemporary consumer seems to get what they want at very little cost. They now assume that music, entertainment and information should be (and there are often ways to get it) free. This however makes it tough for creators of original content to make a living and to optimally produce content. For instance, my own site http://danzen.com has 3 million page views. At a minute a view this is 50,000 hours of entertainment. And yet, from dozens of different attempts at monetizing, the site has made about $500. That is a payoff of one cent an hour. The concern, however, is not just the money — interactive content creators are often happy if people simply use their tools or experience their environments. A far greater concern is that people are partaking less and less in independent interactive content. “Interactivity” can be broken down into types and when referring to interactive content I mean interactivity beyond just navigation to where people can create and communicate with one another. People today are spending increasing amounts of their time on YouTube, Facebook and Twitter. Here, they share pictures, stories and videos that comprise authoritative content, but they rarely share interactive content or take the time to go out and engage in interactive experiences. We can deduce that the attention span of people online has been greatly reduced. They write and read in 140 characters. The status post is the new blog. They are no longer accustomed to spending time reading a story, let alone creating a story. Alongside social media usage, people are increasingly partaking in online gaming. For the most part, gaming is consumption of thrill and is not really creation. Puzzles have the mindset of creation and they hone the mind of the user but the output does not benefit society. Creation via programming also hones the mind, and has the added benefit that the output usually helps society: it educates or entertains and can provide environments to communicate or organize. On a positive note, today there is more creative practice executed in a day than in all of history up to 1950. Millions of songs, art pieces, stories and the like are being made on a daily basis. Proportionally, though, I think less people create. This is probably because there is just so much to consume and to consume is so much easier. Also, creative renaissances come and go, just like any other trend. Those trends may also differ in different regions. I would not say that in North America it is currently “popular” to create although the Maker movement is gaining traction. A recent factor in the creation versus consumption balance has been the onset of mobile devices. Smaller mobile screens and somewhat reduced controls can limit creative production. For instance, graphic designers use many panels in an application such as Photoshop and require precise selections that would be hard to achieve on a mobile device. Even if the interfaces improve, there is often distraction when being mobile, especially in busy areas, and so surely this is not the correct platform for true creativity. Even so, workstations, the ideal site for focused creativity, are being abandoned for mobile devices. People gravitate towards things they are comfortable with. The Internet is a new medium – even more so a medium of mediums – and yet the majority just use it to consume articles, listen to music, view pictures, watch videos and play games. These mediums are easily recognized with single established names and the user has clear expectations before partaking. We do not have a name for a digital interactive feature. We may call it a tool or an application, but this is far from suiting all interactive features. Could we call it an environment or medium instead? Perhaps, but these categories seem a bit broad. If we had a specific made-up name for an interactive piece, project or feature then perhaps there would be more support for sharing and partaking in it because people will instantly understand what is offered. For instance, Neal Stephenson in The Diamond Age calls them “Ractives”. From a personal growth standpoint, we have been led by accountability concerns towards only being our “legal” self. The opportunity to explore personas to interact with abandon has been greatly reduced and marginalized. For instance, we are required by policy to be only ourselves on social media sites such as Facebook – any other personas are removed or at least viewed with suspicion. This is a shame. There needs to be more opportunity to interact with imagination and passion – not just in second life or dating sites but in our average every day life. A site such as http://hipcats.com, allows you create personas and interact with others , making it possible to explore new ways of thinking and acting which may actually lead to real life transformation. It would be great if people slowed down a little and spent more time thinking and creating. The Internet is a wonderful medium to favour creative collaboration. Perhaps exploring fresh personas would give people a better ambiance for creation and help tip the world back to a healthy balance. If your character is an artist or inventor, then you might realize — hey… I can be an artist or inventor! Creative writing can often lead to self-transformation and even invention. I suspect that I am preaching to the converted. If you feel the same way and want your friends to know, please share the article! Hello. Welcome to TEDx Hamilton in a city where we are experiencing a cultural revolution! I am inventor, Dan Zen, and this is Rolli. An art collector from Toronto offered me $500 for Rolli. But she was drunk… so I didn’t sell it to her. Ya… she couldn’t operate the bank machine! Sigh. If Rolli leaves nuts and bolts around, I sweep them up with the Hockey Stick Broom [Dan Zen sweeps with broom]. We inherited an old push broom when we moved into our house in Dundas 17 years ago. I used it for a couple years and then the handle broke off. So I was down on my hands and knees sweeping with the bristles when I got an Aha! moment. This was easier than pushing the broom. And the motion was familiar. Aha! It was like a hockey stick. So I screwed the bristles to a hockey stick and it has been my favourite broom ever since! I stick handle berries and shoot dirt off the patio. Kids love it too! The title of the talk is “Simply Inventive, No More Waiting for Aha!” Because we don’t want to Aha! only when we break brooms. In the case of Rolli, I knew I wanted to make a robot that rolled around and it was only a matter of engineering – problem solving. But we don’t want to only be creative when we problem solve. We should demand to be creative… on demand! Touchy – the mobile app where you take away other player’s points by touching a target on their screen. Tilty – players try and keep their device level while jostling each other in the physical world. Hangy – wear your own mobile device as a mobidallion and express yourself with happy faces, messages, light shows, etc. to people near by. Trippy – view the world through the camera in your device and Trippy applies effects like inverting colors so your friends look like zombies, Kaleidoscoping your girlfriend or jogging through rings of op art! Droner – At a gathering or party, Droner, lets you control your friends! It is simple to invent… if we invent with simplicity. Designers in the audience might say… ya, I know… simplicity is a design tenant. But those designers will also tell you that SIMPLE… is HARD. So I would like to share some techniques to make SIMPLE SIMPLE! Look for basic properties – like position and dimensions. Dimensions have width, height and depth. These are not always easy to see. For example, look how long we were printing with only two dimensions – width and height. And then along comes 3D printing and we finally have depth. This has opened up a whole realm of creativity. Now, there is another basic property at play here. Once again, it can be hard to see – so let’s use a technique called abstraction. The picture behind us is shot in Focuso – out of focus on purpose. This removes the details and simplifies the scene. The wrinkled towels take on an elegant aura of colors. Let’s try abstraction with the words 3D printing. We can abstract the word printing – take it away and we are left with 3D – three dimensions. Let’s take away the word dimensions and we are left with 3. Do we see it now? The basic property I was talking about is the number of things. So we have 2D printing, 3D printing – are you now thinking of 4D printing? Printing that changes with time perhaps – could be cool. But once again, we need to see another basic property. We are counting up – what about counting down. Direction. Perhaps there are inventions waiting in the world of 1D printing. That could have been done already – ticker tape? But in maybe there are new uses in the context of today. Simplicity often comes when we reduce the number of things. That is what I did with Rolli. Most things roll of four wheels – like cars and roller skates. If we go to two wheels we get bicycles and roller blades and things just seem to get more magical. With Rolli, we went to one wheel and this gives us the degree of freedom to make using Rolli elegant – even graceful. With the hockey stick broom, the basic property we used was the angle. The basic property we used with the mobile games is more sublime. To give a hint… it is a relative of position. Not absolute position – location – although there are inventive things happening with GPS and location based interactivity. Not absolute position, but rather relative position. Almost every mobile game happens inside the device. My games happen outside the device. So just that simple switch – inside / outside… in / out let me build powerful, basic games that no one else has made. So how do we find these basic properties? Well, in the case of numbers, we might ask, “how many”. In the case of location, we might ask, “where”. Ya… twenty years of analyzing creativity… ten years of synthesizing that into a philosophy and a creativity framework. And the answer is found on Sesame Street – who, what, when, where, why, how, how much, how many. Unfortunately, it is still tricky because we tend to get caught on the specifics. So I would like to show you a slide from the creativity framework that will help us get past the specifics. When we invent, we usually have a topic in mind – for example, mobile games. Well here we have chairs. If you don’t have a topic, you may as well poke your finger in a dictionary. The first step we do is analyze. We break the chair into its parts – its aspects. If we want, we can just describe a specific chair – use the who, what, when, etc. if you like. The next step is to generalize. So analyze and then generalize. Four is a number, L is a shape, black is a color, leather is a material, sitting is a purpose, etc. Then we think of options. For instance, a chair might not have four legs, it could be three or two, etc. If we’re still too specific, we can generalize again – for instance, color and material have to do with appearance. This reminded me that we can have pattern too – and here is a good one that relates to “when”: does it change? Is it static or dynamic? Lazy Boy made a fortune on chairs that change shape. The final step is to synthesize – join options together. What about a chair that changes color? But why? So when we synthesize, we look for relevance. And if we look at the options for the purpose of the chair, we see – oh… what about a chair that changes color depending on occupant weight! Imagine, sitting on your couch eating pizza and the couch is slowly turning red – not sure we want this! Laugh, laugh. So once again, we analyze – pull things apart, generalize and list options, and then synthesize with relevance in mind. This leads us to purposeful creation. So that I can engineer grace. I am Inventor, Dan Zen – thank you. 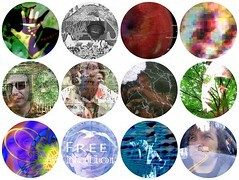 I have been making interactive media for twenty years and now I hope to convince you to try. If you already code then I hope to convince you to try a new system. ZIM. The HTML canvas tag allows you to dynamically manipulate pixels to draw and animate shapes. It was the early 2000s that we got this ability in Flash and it was very exciting. It is now very exciting in HTML where we can use free tools and publish just about everywhere. We can also bring our experience to a very large creative community. While making Web pages for browsing does fall under the realm of interactive media, it can be more specifically called Web design. Interactive media is much more – see the Interactivity Scale. Interactive media allows us to create, communicate and play – not just consume. To make interactive media takes more than just tagging or animating – you have to code (program). This means capturing events and using logic to determine and create what comes next. It means providing a variety of interfaces so people can create things (applications). It means dragging, dropping, rotating and hit tests so people can re-enact the world but in a virtual space. These are things that were not done in traditional Web design and development (aside from maybe dragging items into a shopping cart). Enter ZIM. When I was coding in Flash, I made over one hundred helper classes (a class is a bunch of code that does something and we can use it over and over). These were created over ten years and put into packages but otherwise were a touch hodgepodge. This time, I got to start fresh and planned from the start to let others use and understand these classes. Half of them are now in ZIM version 1. The other half, which are for advanced interfaces like gesture and multiuser will be launched as ZIM version 2. Certainly, there is a lot that can be done with ZIM version 1. You can code with any text editor but it is best if you have syntax coloring so you can see the different parts of the code. Sublime, TextPad, NotePad++, DreamWeaver, etc. Start with a ZIM Template – perhaps the basic template. Copy the source code into a file and name it sample.html. Now drop the file onto a Web browser – Firefox, Chrome, IE, Safari. You should see a big button and if you click it, it will go to ZIMjs. Look at the code and see if you can make sense of it. On ZIMjs, there is information about the functions and classes that are available. There is example code and you can try out the examples. There is also a Docs section that tells you what is available, what parameters you can provide, and what properties, methods and events are available. You can start cutting and pasting bits of the examples at a time into your sample.html and see if you can make things work. You will also need to know how CreateJS works so you can draw circles, rectangles, lines, and use bitmaps (images), sound and animation. You can use tutorials, etc. Read about coding here: Dan Zen Museum Coding Tour. Please try out ZIM and if you need a hand, there is the CreateJS Facebook Group where we answer questions about CreateJS and ZIM. I can tell you now, you are as close as you have ever come to making being able to make interactive media. You need no huge application, no instals, etc. And you can package your code up into a mobile app in less than an hour once you know what you are doing – all free (aside from the $100 dev cost on Apple, the $25 dev cost on Android and $20 for Windows – free for BB). Just copy that template file and start poking around. If you want formal training, I teach at Sheridan College in the one-year post grad diploma program http://imm.sheridanc.on.ca – we have a great learning environment. Here are some open house photos. And below is a Zen Picture set that encompasses about half an hour of focuso shooting so you see that Focuso can be quite varied and you can be prolific with the shots. Focuso helps you understand framing and balance, colors, depth of field, and other important photographic and design elements. Once you see something that looks good in Focuso then you can focus and you often find a balanced shot that works well in focus too. And visa versa is good to try where you put good looking compositions out of focus to see their balance. Zen Vlog has grown to over twenty vlog entries many with multiple videos in the last four months. The rapid growth is in part due to the ease of using the Zen Mix vlogging tool. If you have not tried, give it a go. You upload your picture to a place like Flickr, upload your video to a place like vimeo or Blip.tv and then mix them. If anyone has any questions on what vlogging is or how to use the tools, please ask – we’d be happy to give suggestions to help you get vlogging. All the best, Dan Zen. Future Girl Madeline Zen with Pendant OLED Drone Phone, Personal Magnetic Land Satellite, Chromium Nanobot Dispenser, Brainwave Concentrator, Selecting Sequence for Hologram Gun, and Rapid-growth Two-day Tree Planter. This minus five minute fashion shoot of model Madeline Zen features gadgets by Mad Inventor Dan Zen and Artist Brian Kelly with sound by Dan Zen all within the Zen Picture (Pan Zoom) tool. You can download this tool and use it with your pictures and sounds for free! Read the instructions for how to pan and zoom – after doing it a few times – it’s easy! Both Tapoll – the predict-a-poll site at http://www.tapoll.com and Zen Mix – the vlogging tool at http://www.zenmix.com have been added to the Museum of Modern Betas at http://momb.socio-kybernetics.net. MoMB is a neat site that lists the new wave of Web 2.0 sites and their popularity based on Del.icio.us bookmarks. Click here if you would like to add Tapoll or Zen Mix to Del.icio.us. We’ve created a series of Zen Mixes for Baron Digbody’s Castle – the creepy castle caper written by the Moustache and previously featured as an interactive online mystery at http://www.moustachemysteries.com. These characters were posted weekly on Zen Vlog leading up to Halloween. You can also get the booklet along with links to all the mixes below and host your own mystery party. We have done so several times with this mystery and it is a blast! Full instructions for the mystery party are given as well. The mystery can be played with 8-12 characters. The links to the mixes are special private links so you can e-mail a link to a guest and they will only know how to access theirs. Have some fun… host a mystery party… these cost over $20 in the store and you are stuck with the environmentally taxing packaging. Plus, no other mystery is quite as zany as a Moustache Mystery! The Grim Reaper’s Age Guesser has guessed well over 200,000 ages and gets 5% correct, 35% within three years and over half within 5 years. Zen Alarm is rapidly approaching a million views at about 150,000 views a month as a module on Google homepages. Zen alarm lets you play any Web MP3 as a time-based alarm. Zen Alarm 2 adjusted how the alarm worked and added the feature of launching any Web page at a certain time. Also in the selection is to launch the latest vlog from Zen Vlog. Zen Alarm 3 is planned with the following features to attend to functionality requested by an astute and lucid user named Harel – our thanks! Tapoll is a new Web 2.0 site that lets you share polls. And these are not just any polls – they are predict-a-polls where you can predict and vote on the poll at the same time. “The predict-a-poll feature adds an inventive twist to the traditional poll and can reveal whether you are a good predictor as well as if you yourself are predictable” says Dan Zen, inventor of Tapoll. The Tapoll site also lets you view items from other popular Web 2.0 sites like Flickr, YouTube, del.icio.us and digg that relate to the poll to inspire poll creation. You can click the Tapoll icon next to an inspirational item to make a poll that refers to that item. Creators can then drive traffic to the poll by placing a link to the poll in the comment area of the inspirational site. Dan Zen explains, “For instance, I was answering a poll on the Grim Reaper, and under the YouTube feed there was a link to a prank where a live Grim Reaper was superimposed onto a security video in a shop so it showed up behind people in line. After watching the video, I clicked the Tapoll button next to the link and created a poll with a reference to this video. The poll asks, in a sense, whether it is ethical to do such an extreme albeit funny prank. To get more people to take this poll, could click the link at the top of the poll to find out the URL to the poll. Then I would copy this URL with the message “this inspired a Tapoll poll” into the comment area of the Grim Reaper video on YouTube. YouTube might have an issue with URLs in comments but you can just say”this inspired a predict-a-poll at Tapoll com”. Tapoll, lets you embed polls on your site such as mySpace and Blogger – you can also chose to make the poll private. A graph feature is available that shows the largest over prediction and under prediction as well as the closest prediction. A percentage of voters who voted for the same option they predicted is also provided. The site was built by Mad Inventor Dan Zen at http://www.danzen.com who recently launched Zen Mix at http://www.zenmix.com a vlogging tool that lets you put Web video over a picture and apply cool blend modes. Dan Zen is giving a talk at the Toronto chapter of Dorkbot tonight at 7:00 or 7:30 at Interaccess – also speaking is friend Matt Mazur. Please see Dan Zen’s vlog, Zen Vlog for examples. Recent examples include the second installment of META the nano anti-gravity mystery, Recreational Ravines – turn the ravines into Ewok villages!, a fascinating fact about the world population, and more! Vlogging is easy, fun and quick – try Zen Mix! Hmmm, sounds like a jingle. Our Meta anti-gravity nano sci-fi mystery has made the front page of google for the keywords sci-fi mystery. Meta will be delivered as a prophetic poem of Zen Mix vlogs and shown on the site http://zenvlog.wordpress.com which features a number of other vlogs (video blogs) by mad inventor Dan Zen. Here are the Google Results click to try! META has soft-launched as an experiment in storytelling using Zen Mix. Click here for the vlog entry on Zen Vlog. Zen Mix quickly allows you to distribute stories in an artistic manner. Just record video of your story and post it on Vimeo and then post a picture on flickr for the background. Go to Zen Mix to mix the two and apply effects. That’s it – free and fast. Of course you can post your pictures and video anywhere on the Web – it needs to be flv video which vimeo will convert any format to and host it for you. Mad Inventor, Dan Zen, has just launched Zen Mix a free vlogging tool. A vlog or video log is an extension of blogging where instead of a text and picture post you have a video post. Zen Mix at http://www.zenmix.com takes this one step further by allowing you to put Web video on top of a Web picture and apply cool blend effects all in seconds for free. This makes your vlog look much more interesting than just a talking head. Zen Mix also features Mash technology to allow you to string mixes together by specifying the file names in the URL. You can use squiggly braces to randomize these, square brackets to pick a random mix from any within and round brackets to force sequence. Nested combinations of these work as well making the feature very powerful. On Zen Mix there is an introduction mash, a features and error mash and a love mash showing mixes of people who dig Zen Mix. The introduction mash shows how you can take a $200 digital camera and easily make a Zen Mix file in a couple minutes. You host your video at http://www.vimeo.com and your picture at http://www.flickr.com and simple put the URLs into Zen Mix, size and position and apply effects. All this is done freely and very quickly online. It should be noted that the Zen Mix site is quite possibly the first site to have only video content including the privacy message, error messages, promotional and instructional material, etc. Best of luck and send us a love mash! Mad Motorcyclist Wins iPod Chat Napping! Jason Evangelinos has won the Chat Nap challenge at http://www.chatnap.com. He had 53 wins narrowly beating out the second place player who was at 49! Jason, pictured here on his motorcycle with the iPod 2 gig Nano prize, is a master of speed and response! Chat Nap is the new game from inventor Dan Zen where you try and catch your friends away from their instant messenger when they say they are there! There are over 500 players in the first few months ~ keep spreading the word! Pictures of flowers mainly tulips at the Hamilton Rock Garden in by the Rose Garden, Tulip Garden, Lialac Dell, Snake Road, The old fishing bridge, Hidden Valley, and more. Owned by the Royal Botanical Gardens. Click here to see the Zen Picture presentation.